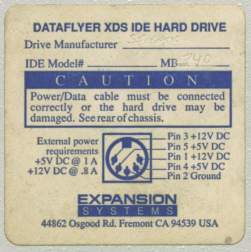 The Dataflyer XDS is not strictly an IDE controller but an external unit designed to house a 3.5" IDE hard drive, and make use of the A600's and A1200's internal 2.5" IDE port. The unit draws it's power from the external floppy drive port, or it can use an external power supply. See below for details of power requirements. 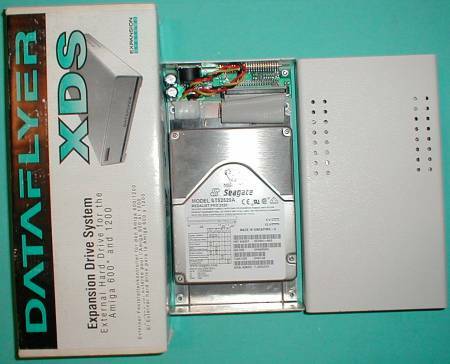 The third picture shows how the Dataflyer XDS connects to an Amiga, an A600 in this case. 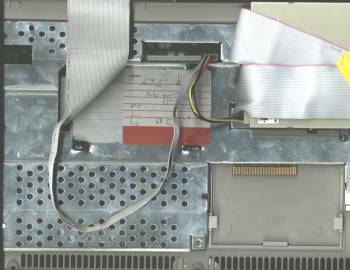 The ribbon cable connects directly to the IDE header and the floppy power cable is replaced with the attached pass-through cable to power the drive if an external power supply isn't being used. The ribbon cable can then be fed out the PCMCIA port, through the expansion port on the back of an A1200, or through the back of the case if a little bit of plastic is trimmed away at the seam. The power connector is a female DIN-5. The power requirements are +12V @ 10.8A and +5V @ 1A.